More than 80% of customer service conversations on social happen on Twitter, which means brands have a unique opportunity to communicate directly with their customers on this channel. Over the past year, Sprout Social and Twitter have worked closely to help further technology solutions that enable a smooth social customer service experience. Today, in conjunction with Twitter, we’re pleased to announce two more powerful new tools that help brands streamline customer care conversations and better gauge how well they are providing service to their customers. Both of these new tools are built upon the Direct Message experience. The first—a simplified process to transition from a public to private conversation on Twitter—will be available to all Sprout users on Monday, Feb. 22. The second—a new experience allowing brands to gather direct feedback from customers after a service interaction—will be available in Sprout’s Advanced plan in the near future. Many customer service interactions on Twitter start in the public realm. In fact, the public, conversational and real-time nature of the platform is, in large part, what makes Twitter such a powerful place for customers to communicate directly with brands. Many customer service interactions require brands to take the conversation private—for example, to gather personal account information or resolve a billing issue. Direct Messages give brands an effective channel to continue their conversation with customers on Twitter. 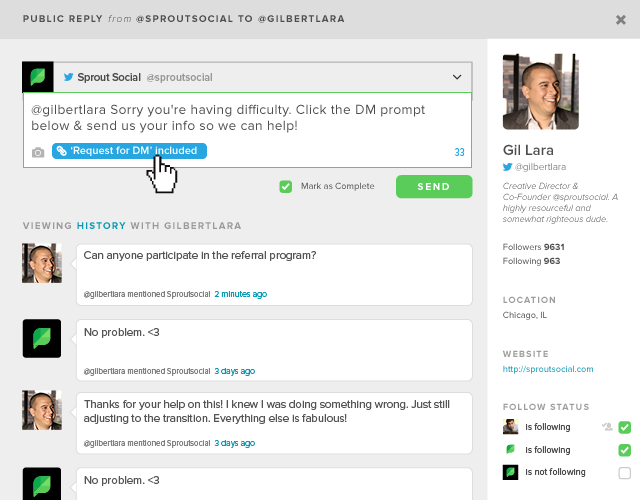 And starting Monday, Feb. 22, in Sprout, the new Add DM Link button in the lower left corner of the Twitter reply screen will enable you to seamlessly embed a DM prompt when replying to a customer. This prompt is a standardized deep link that takes the customer directly to their Direct Message compose screen. When your customer receives the reply on Twitter.com, they will see the actionable prompt that says, “Send a private message,” alongside the icon for composing a new Direct Message. It’s that simple! This easy yet powerful workflow seamlessly drops your customers into a DM compose window. In addition, the original reply Tweet is automatically embedded in the DM thread for added context. Your customer will see exactly what they were replying to, creating a seamless public-to-private transition. Important: Keep in mind that these new DM prompts are effective only when you have configured your settings on Twitter.com to allow for anyone to DM your business. Once this setting has been configured on Twitter natively, it may take up to 2 hours for Sprout to recognize the updated setting and thus start displaying the Add DM Link button in your Twitter reply window. Research shows that people are 25% more likely to be satisfied with a brand after a friendly customer service interaction on Twitter. Furthermore, of those who had a friendly interaction, 76% were likely to recommend the brand. What’s more, of those who had an unfriendly interaction, 82% were unlikely to recommend the brand. So this begs the question: How do you know if your customers believe their interaction with your brand was friendly or satisfactory? 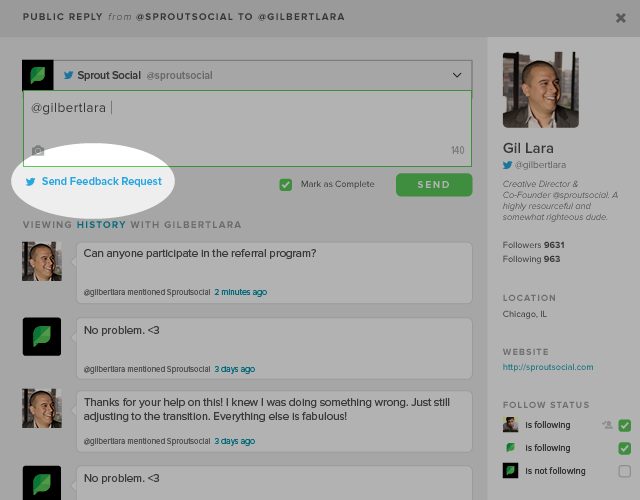 To help answer this question, Sprout has worked closely with Twitter to integrate Customer Feedback, a new survey experience using standard customer satisfaction and Net Promoter® questions. It enables users to privately share their opinions with businesses after a service interaction on Twitter. Leveraging Direct Messages to deliver these surveys allows for a safe, personalized feedback interaction all within the core Twitter experience. This new workflow provides a simple and structured way to gather valuable insights that can greatly improve your customer care efforts. Customer Feedback will be available in Sprout’s Advanced plan in the near future. To learn more, read Twitter’s official announcement. Studies show that providing world-class customer care on Twitter impacts the bottom line. Data also shows that resolving an issue on Twitter costs less and often leads to customer satisfaction ratings of over 90%. Therefore, using Twitter tools to more seamlessly manage your brand’s service-related conversations and gather customer feedback will not only directly benefit your customers, but it will also be a sound investment for your business overall. Stay tuned for more updates and enhancements that enable you to better serve your customers, Tweet by Tweet.